Imagine a library, a library in which you can learn to transform your life through the use of macrobiotics. "Macrobioteca" is a place to study and for self-study, a place of discovery and self-discovery. Here you will find recipes, videos, articles, opinions, and a world of content about the macrobiotic way of life. You will discover that health is an ever-changing process, not something static but something we are always closing in on or drifting away from. You are invited to discover the role you play in your own health. For that I give cooking classes and hold cooking workshops, as well as talks and presentations. LET'S DO IT, ALL HANDS ON DECK! Let´s say you have decided to take a more thoughtful approach to what you eat, perhaps for health reasons or because you are concerned about living in, at times, a world with such imbalance as ours. Maybe, you are following a macrobiotic diet, and you are somehow a bit at a loss regarding how to proceed and keep track of quantities and proportions. Whatever the case, you have decided to take your health into your own hands and this means starting to do something you have never taken seriously, cook! This is new, and to top it off, you have to cope with new ingredients, a wide range of grains you had never before heard of, cooking methods away from the norm and Japanese products (Miso, Tamari, Shoyu, Umiboshi... No wonder then that at times we may feel overwhelmed or not know where to start or how to continue! Quite often, in these situations I find myself with people who say: "But I will be stuck in the kitchen all day!" Do not worry, don´t fret, you don´t have to go crazy or try to do things to perfection. Everything is a question of a little organisation, of planning what to do, when and how. I can help you to create variety in your cooking, to create well-proportioned, well-balanced menus. Eating vegetarian, vegan or following “macrobiotics” doesn´t automatically lead to health. Health is a process, not a state. We are always moving towards and away from it through our choices in food and how aware we are of this process. Together we will make delicious grain creams for breakfasts, as well as delicious and easy to cook recipes and efficient combinations of dishes. We well also understand what cravings are, their origin and how to deal with them in a healthy way. Together we will solve any doubts or problems you may have. Just remember that macrobiotics brings us together with our surroundings and connects us with our inner self, helping us achieve our objective of becoming the person we want to be, and live your life to the full. You have decided to start changing your life through healthy eating and “the longest journey starts with just one first step”. I can help you reach your goals through changes in your lifestyle. It is up to you to decide when, how and where. 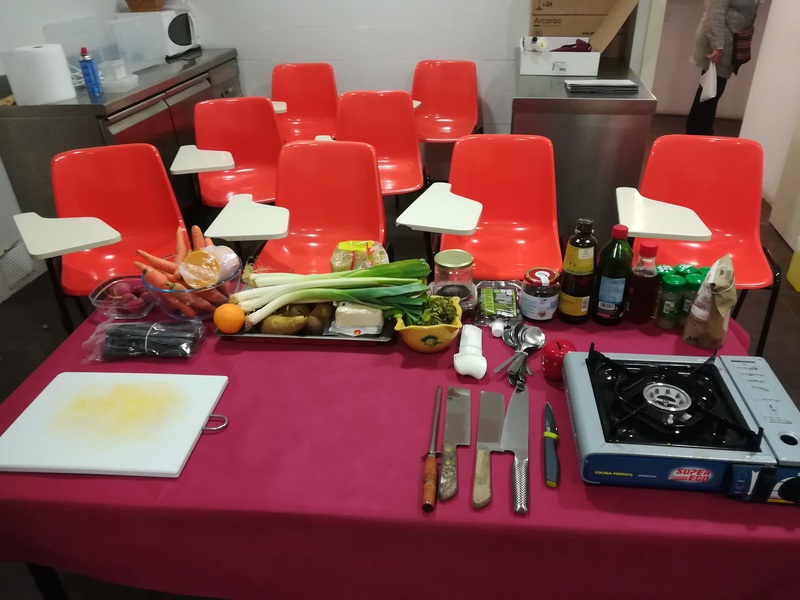 I give cooking lessons and workshops on a range of cooking and eating related subjects, as well as those particularly focused on certain conditions and natural remedies for them through cooking. In all of them, students take an active role, while we explain the underlying concepts of macrobiotics as a way for self-discovery. 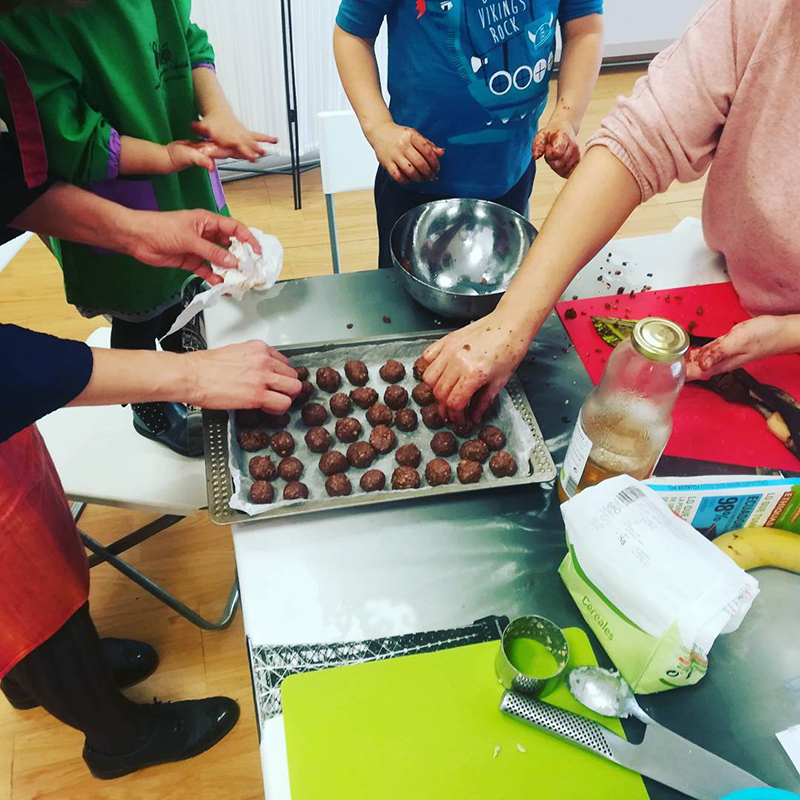 Classes and workshops are available both in Spanish and English, in appropriate venues such as civic and cultural centres, schools and restaurants. During the classes and workshops we always make a whole menu from grains, legumes, vegetables and algae, as well as seeds and nuts. One of my favourite workshops is that entitled “Macrobiotic Breakfast” where we explore the little-known alternatives to the traditional breakfast which normally brims with sugar and dairy products and whose drawbacks have been widely documented in scientific literature. Workshops differ from classes. Here we put on our apron and get down to cooking in a practical way, where you become responsible for the dish you are cooking. This is really valuable since you gain hands-on experience with what making a dish involves. I will accompany you through this process, making corrections where necessary and suggesting improvements. This way we will learn together and grow together through an enriching experience. Send us your comments, thoughts and feedback on any issues you would like to discuss.